tissue might be what is making my knee immobile. My therapist has pushed my flexion to 150 degrees (on a good day) but my extension is lacking. I usually start my therapy session at negative 3-4 degrees. With much work by my therapist, we can get the extension to positive 2-3. I feel good walking at that number although the extension on my good leg is positve 4-5 degrees. However, as soon as I sit flexed or I wake up in the morning the progress is gone and I'm back to negative 3-4. Why , after 5 weeks, can't I maintain any of the progress I achieve in therapy? I suspect scar tissue problems again. My knee cap feels "stuck" and my knee mechanics feel just "wrong". 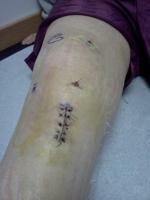 Are there any other options for scar tissue besides surgery? How do I keep the scar tissue from returning again? Please help, Bart (or anyone else), I'm at my wit's end. I'm very depressed, it's been 5 months since my accident and I'm not recovering. I just want to return to my job as a firefighter and to my very active lifestyle. Most of my day is spent rehabbing, stretching, icing, massaging or thinking about my knee. I just don't know what else to do. I'll be out of town for the next 2 weeks and my next doctor's appt. is on Sept. 2nd. Do you have any experience with this or any advice for me?